The District K office, in partnership with Trees for Houston, Centerpoint Energy, and the Brays Oaks District, hosted a Fall Arbor Day kick-off event within the Brays Oaks and Westbury areas on November 12, 2016. The staging location was the corner of Willowbend Blvd. at Bob White Dr. within the Brays Oaks District. The Fall Arbor Day tree planting event included the planting of 40, 15-gallon crape myrtle trees along the right-of-way easement of Willowbend Blvd. between Sandpiper Dr. to Bob White Dr. Additionally, 30, 15-gallon live oak trees were planted along the esplanades of South Post Oak Rd. between Gasmer Rd. and Willowbend Blvd. These live oak trees will complement the aesthetics of the Willow Waterhole Greenspace Reserve. 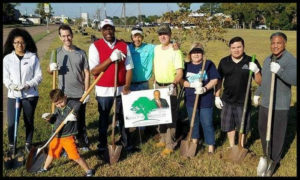 As part of Council Member Green’s Klean It Up/Green It Up program volunteers from the Westbury and the Brays Oaks communities, joined Council Member Green to dedicate the trees and talk about their value to the neighborhood and the community. “Working with Trees for Houston, we chose this area because the Brays Oaks District agreed to maintain the trees for the next 2 years. Thanks to the generous donation by Centerpoint Energy, who paid for the trees, this area will now have full esplanades that are aesthetically pleasing to our residents and those who drive in the area,” states Council Member Green.